Regardless of the criticism of President Musharraf's politics or personality, there is general agreement among independent economists that, through his structural reforms and economic management, President Musharraf left Pakistan's economy in much better shape than he found it when he seized power in 1999. 1. Pakistan's tax base and government revenue collection more than doubled from about Rs. 500b to over Rs. 1 trillion. 2. 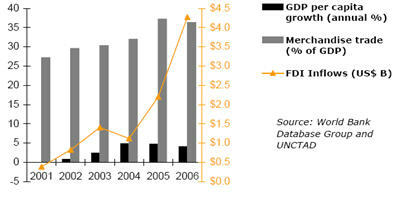 Pakistan's GDP more than doubled to $144b since 1999. 3. Most recent figures in 2007 indicate that Pakistan's total debt stands at 56% of GDP, significantly lower than the 99% of GDP in 1999. 4. Pakistan attracted over $5 billion in foreign direct investment in the 2006-07 fiscal year, ten times the figure of 2000-01. Contrary to accusations by Musharraf's detractors that it was an artificial consumer-led growth, it was really an investment-led boom that Pakistan experienced in Musharraf years. 5. In spite of the election-related political turmoil, Pakistan’s economy maintained its momentum in 2007, growing by 7%, slightly more than the 6.6% for 2006. Agricultural sector growth recovered sharply, from 1.6% in 2006 to 5% in 2007, while the manufacturing sector growth continued at 8.4% in 2007, slightly more moderate than the 10% for 2006. Services grew at 8% in 2007, down from 9.6% in 2006. 6. The strong consumer demand in Pakistan drove large investments in real estate, construction, communications, automobile manufacturing, banking and various consumer goods. Millions of new jobs were created. By all accounts, the ranks of the middle class swelled in Pakistan during Shaukat Aziz's term in office. According to Tara Vishwanath, the World Bank's lead economist for South Asia, about 5% of Pakistanis moved from the poor to the middle class in three years from 2001-2004, the most recent figures available. In 2007, analysts at Standard Chartered bank estimated that Pakistan has a middle class of 30 million which earns an average of about $10,000 per year. And adjusted for purchasing power parity (PPP), Pakistan's per capita GDP is approaching $3,000 per head. 7. The Karachi stock market surged ten fold from 2001 to 2007. 8. Pakistan positioned itself as one of the four fastest growing economies in the Asian region during 2000-07 with its growth averaging 7.0 per cent per year for most of this period. As a result of strong economic growth, Pakistan succeeded in reducing poverty by one-half, creating almost 13 million jobs, halving the country's debt burden, raising foreign exchange reserves to a comfortable position and propping the country's exchange rate, restoring investors' confidence and most importantly, taking Pakistan out of the IMF Program. The one sore spot that sticks out in President Musharraf's and Shaukat Aziz's record is their lack of attention to the rising energy needs of the country. Appropriate planning should have comprehended new power plants to support growth forecasts. There were other mistakes as well, such as the decision to export wheat in 2007 that created shortages and price hikes that helped bring down the PML (Q) government and ultimately led to President Musharraf's departure. Since the takeover by the PPP-PML(N) coalition, there has been a sharp decline in Pakistan's economy. Summing up the current economic situation,the Economist magazine in its June 12 issue says as follows:" (The current) macroeconomic disarray will be familiar to the coalition government led by the Pakistan People's Party of Asif Zardari, and to Nawaz Sharif, whose party provides it “outside support”. Before Mr Sharif was ousted in 1999, the two parties had presided over a decade of corruption and mismanagement. But since then, as the IMF remarked in a report in January, there has been a transformation. Pakistan attracted over $5 billion in foreign direct investment in the 2006-07 fiscal year, ten times the figure of 2000-01. The government's debt fell from 68% of GDP in 2003-04 to less than 55% in 2006-07, and its foreign-exchange reserves reached $16.4 billion as recently as in October." Please read "Pakistani Economy Returning to the Bad Old Days". In addition to the improved economy, President Musharraf's policies enabled halving of poverty from 34% in 2000 to 17% in 2008, proliferation of independent radio and television stations, and an expanded middle class, which ultimately led to his downfall. It was on "dictator" Musharraf's watch that Pakistan saw unprecedented deregulation of the mass media, prolific growth, and vibrant debate that had never occurred before him. None of the "democrats" or "dictators" who ruled before him gave such a gift to the people of Pakistan. It is this media freedom that I think is Musharraf's best legacy that can not be easily denied or reversed. It'll serve Pakistan well by shining light on the misdeeds of Pakistan's leaders now, and in the future. I find your blog really interesting. However, I have a question regarding your post August 19, 2008- Musharraf's Economic Legacy. You stated here that 5% of Pakistani moved from being poor to the middle class. What are your sources? I can't seem find the original source from Worldbank's website either. Diep: "You stated here that 5% of Pakistani moved from being poor to the middle class." "The size of Pakistan’s expanded middle class is in fact debated. Tara Vishwanath, the World Bank’s lead economist for South Asia, said 5 percent of Pakistan’s 160 million people — or roughly 8 million Pakistanis — appear to have moved from living in poverty to being part of the lower middle class between 2001 and 2004. She said data being collected this year was needed to confirm whether the increase was permanent." More recently, ADB has published a report saying Pakistan's middle class is 40% of the population. The former military dictator Pervez Musharraf should be tried for high treason, Pakistan's prime minister said, raising the prospect of a serious clash between the country's civilian and military masters. A treason trial would mark the first time in Pakistan's history that a military ruler has been held accountable, and the decision was cheered by many who believe the country's overweening army needs to accept the primacy of elected politicians. The announcement by Nawaz Sharif, Pakistan's recently elected prime minister, ended months of speculation over whether the government would dare take on a former president and army chief who could face the death penalty if found guilty of overturning the country's constitution. Only the government is able to try someone for treason, for which a special court would have to be established. Although Musharraf is currently under house arrest and has negligible support in the country, many observers have long claimed the still powerful military elite would never allow a civilian court to try one of its former chiefs. "Musharraf is still more popular in the army than [his successor General Ashfaq Parvez] Kayani," said a lawyer, Chaudry Faisal Fareed. He said Sharif risked "opening a Pandora's Box" if the trial expanded to drag in other high-ranking officers. Musharraf's actions amounted to high treason, Sharif told parliament on Monday , promising that the former dictator had to "answer for all his deeds in court". In the view of many lawyers, Musharraf is likely to be successful in defending himself against those charges, but treason charges are "an open and shut case", according to Fareed. Talat Masood, a retired army officer, said a trial was inevitable given that Musharraf had alienated two of the country's most powerful men: Sharif, whom he toppled in a 1999 coup, and Iftikhar Muhammad Chaudhry, the activist chief justice who was the object of the then president's battle against senior judges in 2007. "It's a gamble, no doubt about it," said Masood. "Sharif is taking a certain element of risk because the fight against militancy is the greatest challenge Pakistan faces right now and he needs the military for that." Many assume that even if the trial does go ahead, a political deal will be hatched to spare Musharraf's life, or even allow him to leave the country to live out his days in exile. 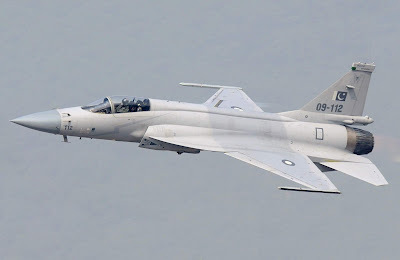 One possible scenario might see the intervention of Saudi Arabia, one of Pakistan's closest allies. Such an outcome would be rich in irony given that Sharif was given exile in the kingdom after he Musharraf deposed him. Akhtar Hussain, a former vice-president of Pakistan's bar association, said it was likely Musharraf would ultimately receive a presidential pardon after a long legal process that is likely to stretch into 2014 and beyond. Merely putting the former general on trial would mark an important milestone for Pakistan, he said. "The key thing is the initiation of the trial itself, which is very important for the standing of democratic institutions in this country. The result, whether acquitted or ultimately pardoned is a different matter."